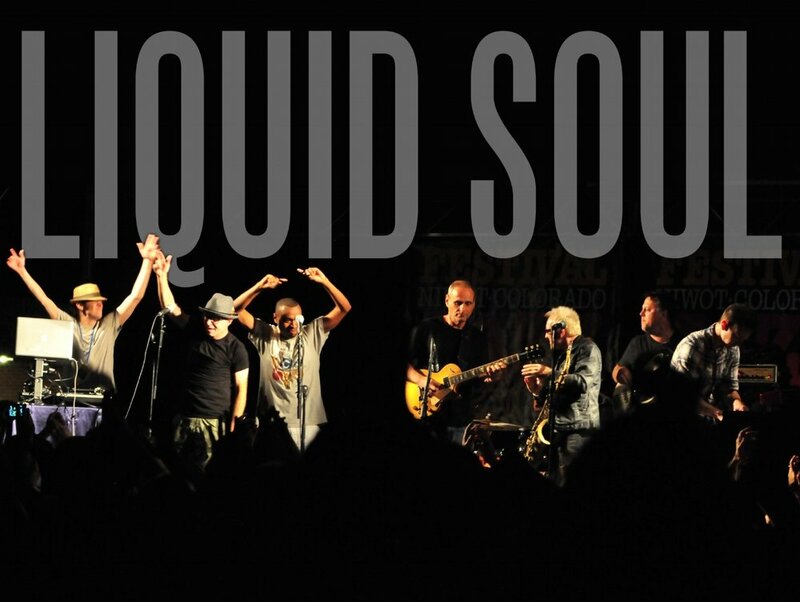 With a marathon touring schedule that has included everything from performing at the Presidential Inaugural Parade to headlining the first acid-jazz performance at the Newport Jazz Festival, Liquid Soul has evolved into an intuitively tight outfit that knows no stylistic limitations. The amalgamation of genres created by the eight-piece collective is a blend of pure musicianship, a fiercely passionate fire and the inherent fun of a pure dance groove. The result is a unique live music experience that draws a diverse legion of fans, spanning across multiple age and ethnic groups. A Music Video For the band Liquid Soul covering the Dizzy Gillespie Classic Salt Peanuts for Ark 21 Records. Blue Note Recording Artist Kurt Elling & Grammy Award Winner provided the intro to the song. Liquid Soul is a Grammy award winner and played Bill Clinton's Inauguration. The story of Liquid Soul begins in 1993, when the band was at the forefront of a burgeoning acid-jazz movement in the Midwestern United States. Evolving from free-form hip-hop jams, the band coalesced spontaneously and soon found a home every Sunday night at Chicago’s Elbo Room. Word spread fast, attracting like-minded individuals from far and wide to the small stage. Thanks to these auspicious midnight marathons, Liquid Soul soon solidified into a steady working unit. The group quickly morphed well beyond their improv-oriented acid jazz beginnings, and their eponymous, do-it-yourself debut album – originally released in 1996, on their own Soul What label – was quickly picked up and distributed by Ark 21 Records. The band was thrust further into the limelight after a highly publicized gig at Dennis Rodman’s birthday party. They relocated their regular Sunday night gig to the Double Door in Wicker Park and held it =for nearly four years (February 1996 to December 1999). In that time, they rarely missed a Sunday evening while playing nearly 200 gigs a year throughout the U.S. and Canada, as well as Germany, Turkey, Russia, Mexico, Austria and Japan. Along the way, the band has garnered nationwide acclaim. They have opened for Sting at Madison Square Garden and Central Park, played at the inaugural parade and 21st century ball, and twice rocked South By Southwest, where they were heralded by the Austin American-Statesman as “the single hottest showcase of the festival.” In addition to their ambitious tour schedule, they also recorded three more critically praised albums – Make Some Noise (1998), The GRAMMY nominated Here’s the Deal (2000) and Evolution (2002). The band joined the Telarc label in 2006 with the release of One-Two Punch. The recording enlists a small army of cutting-edge players, including a few high-profile special guests: turntable virtuoso DJ Logic, Living Colour guitarist Vernon Reid, Widespread Panic keyboardist John “JoJo” Hermann and Smashing Pumpkins drummer Matt Walker. Live or in the studio, playing it hard or smooth, Liquid Soul is a fiery concoction of classy soloists, heavy rhythm merchants and hip-hop cognoscenti. They are in a group that thrives on contact with their audience. One cannot help being moved by Liquid Soul’s ongoing party philosophy. The band’s in-the-tradition repertoire extends from classic compositions by Ornette Coleman and Miles Davis to excursions on the latest breakbeats and mad samples. They continue to bridge the musical gap between standard jazz improvisation and urban rhythm. And as always, the band stays true to its roots with a continued philosophy of bringing jazz back to the dance floor.